Welcome to the Perrin Press! 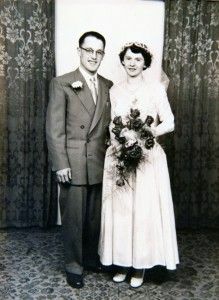 This is a family website – a place to share our stories photos about our family past and present. The site came to be as a collaboration with the direct decendents of Merton Stuart Perrin and Jessie Pearl Perrin (Starchesky). Mom and Dad met in Binscarth when he worked for Cornel’s Garage as an Accounting Clerk. Jessie was born and raised in Binscarth and she worked at the 580 Hotel when she met Dad. They married in about 1954 and lived with Gramma Starchesky (Katie) for awhile until they got their own place. Dad grew up in Spy Hill area and his parents were Stuart and Eva Perrin. Dad passed away at the very young age of 63 after battling cancer for a few years. After Mom (Jessie) sold the House on Bonny Avenue, she moved into the Lion’s Manor for quite a few years until she had to go to the Personal Care Home. Mom passed away in September of 2014 as she suffered a stroke and then got pneumonia.